Dream loot: Polaroid camera. Finally happened! 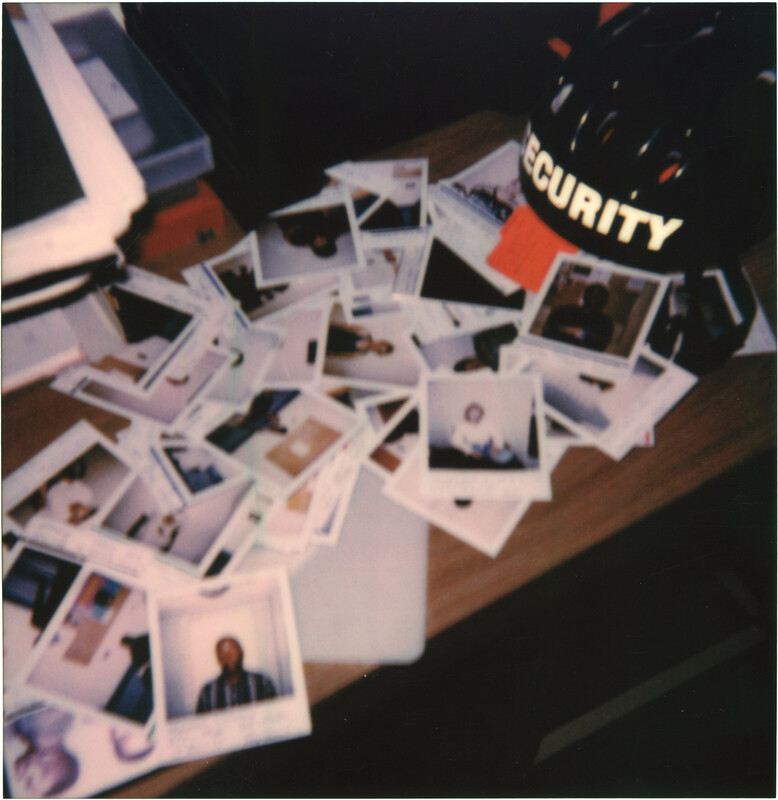 During the big raid on an abandoned mall’s management offices in June (the one where we found historic photographs), we also found the Security office had been broken into since our last visit. Amid the piles of 20 year-old police reports, ancient CCTV equipment and photos of apprehended shoplifters was this guy: the camera that actually took them. 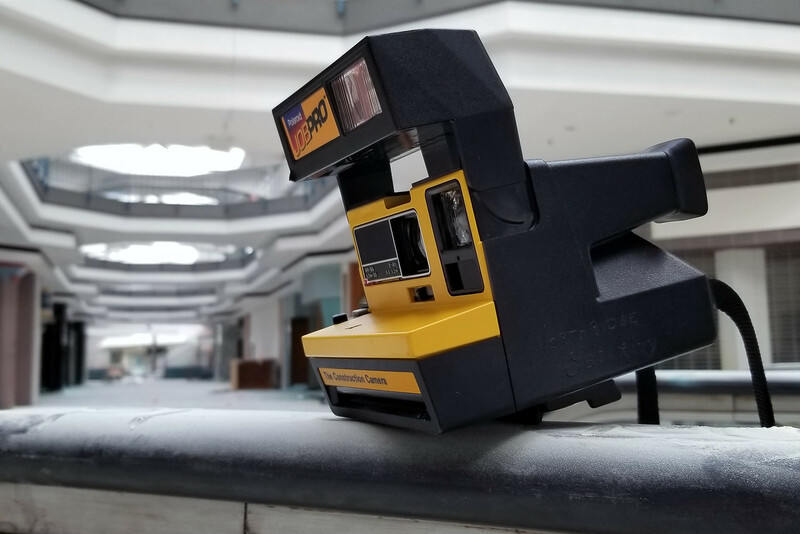 It’s a humble Polaroid Job Pro “Construction Camera”… fancy marketing gimmick for a Polaroid OneStep 600 with black and yellow markings, sold to blue-collar and tradesman types under the guise that it would withstand whatever abuse they threw at it. To date, I don’t think anyone has actually tested those claims. Polaroids of bad people. There were binders and plastic bins full of pictures of those picked up by mall security for everything from shoplifting to vandalism and burglarizing cars in the parking lot. 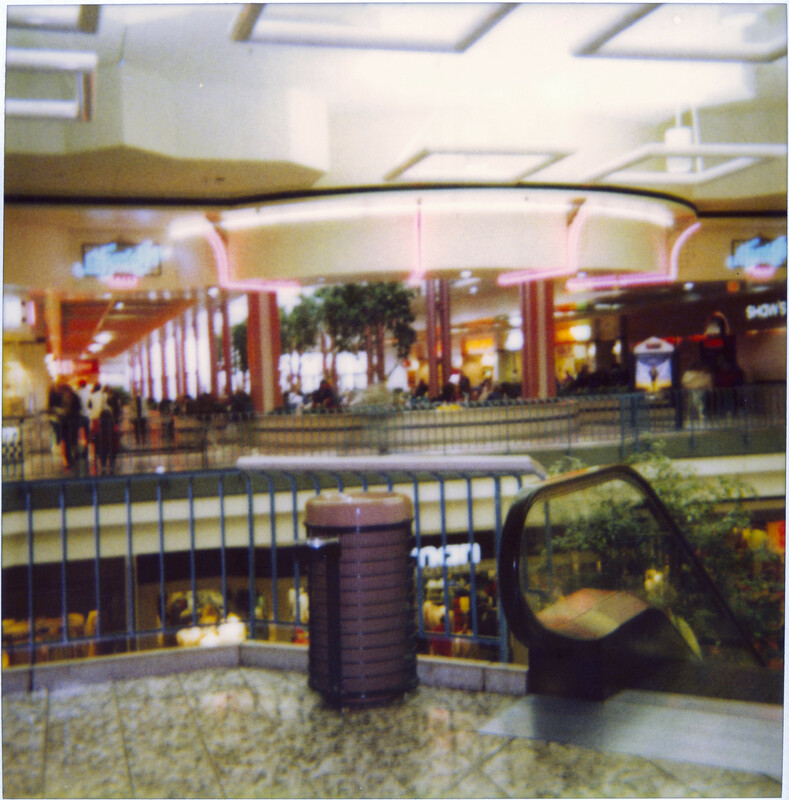 The area that developed around this mall went downhill rapidly in the 90s; unsupervised youths frequently clashing with each other and intimidating shoppers ultimately gave the mall an unsafe reputation toward the end. Jesse Anderson didn’t help things. 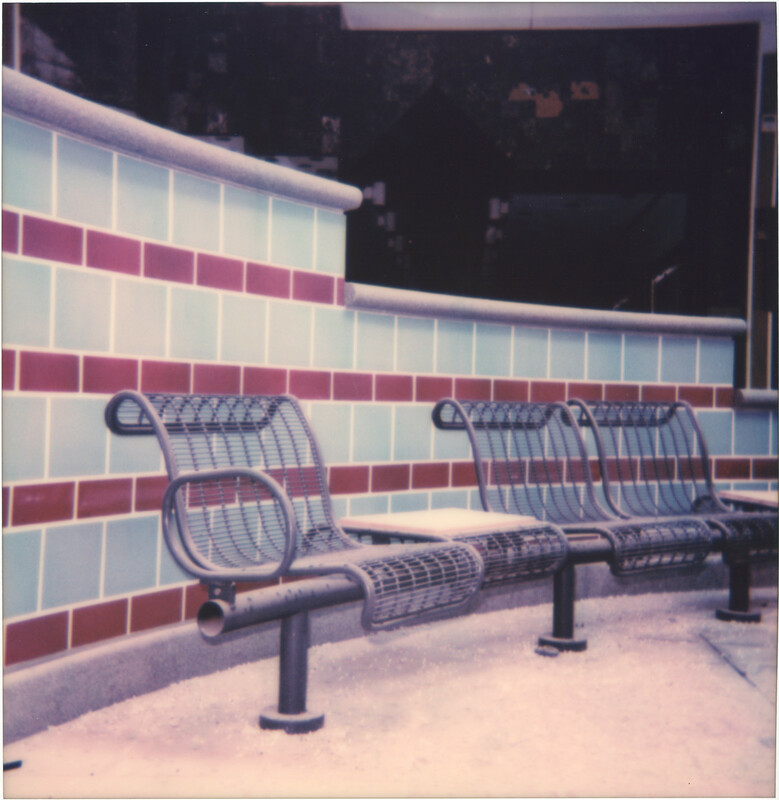 Yeah, this image is blurry… I haven’t used a plastic box-type 600 camera in years, I now remember why. These two come out of the mall’s bi-level movie theater, which to my knowledge never saw a serious remodel in the 25 years or so it was open — that groovy Bauhaus font can be found all over the place! This six-screen United Artists house had a strange configuration: the first three screens opened first with the mall on the lower level, then the last three were built a later date on the upper level, with a single escalator going upstairs to connect them. 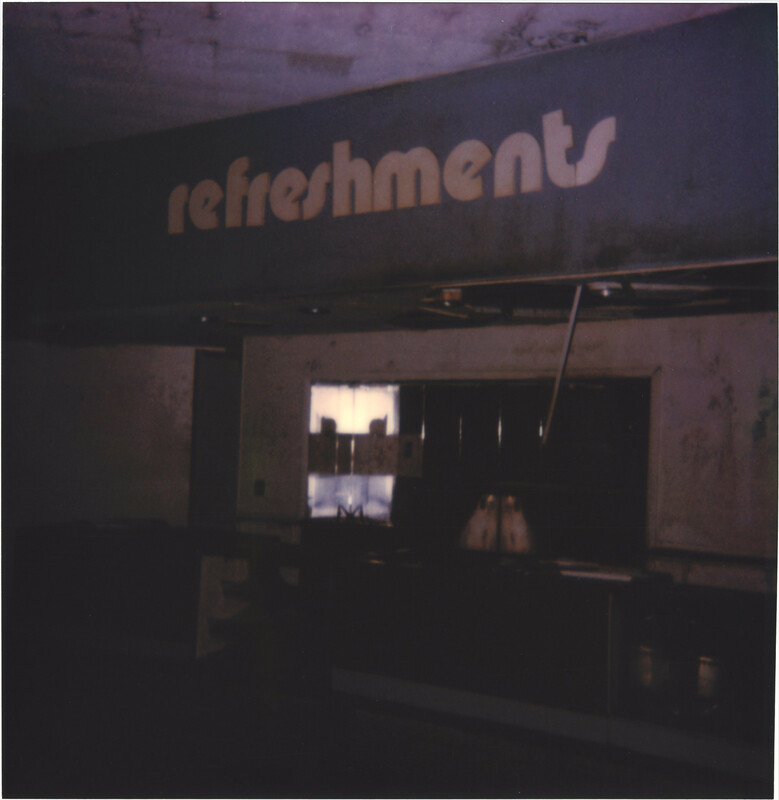 I recreated a Polaroid photo of the mall’s food court that I found in the management office. Based on the date code on the back of the image, I figure it was taken in the early-90s, and given the vintage of the camera it’s entirely possible both views could have been taken with the very same camera. There was a sticky note on the back of the ’90s view: “Skyridge Cafes 68%”… I’m presuming the occupancy rate of the food court. 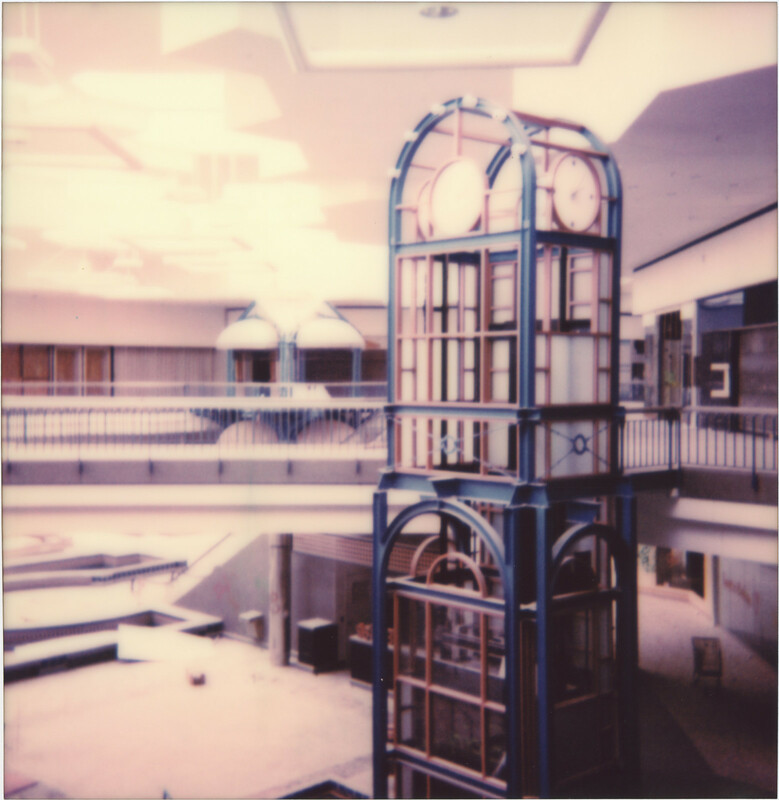 The pastel-colored, skeletal elevator tower was added to the mall’s Grand Court in foresight of the Americans with Disabilities Act passing two years later. 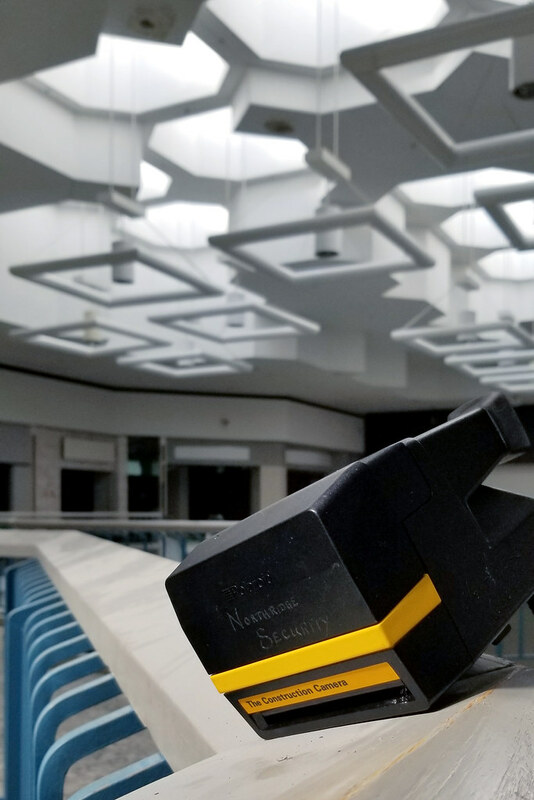 It was among the more functional pieces of a 1988 remodel, which otherwise clashed pretty badly with the rest of the mall’s early-70s contemporary architecture. Its sister mall, on the south side of the city, received the same treatments the same year; it is still open for business and has since either removed or made all of these features easier on the eyes. Bench seating that hasn’t been anyone’s hangout spot since the beginning of the junior Bush administration. Unfortunately likely to soon be torn out by illegal scrappers that have recently invaded the mall, destroying everything in their path. They’re now coated in a thick dust not from time but vandals setting off any fire extinguisher they can get their hands on. “The secret shopper.” This was supposed to be a reflection shot but I botched it by not firing the flash. Speaking of scrappers, at this point I was no-longer alone in the mall and now having to use caution in wandering the main corridors. Not long after taking this photo I decided it was best to duck out, only takes one idiot to ruin everyone’s day, inside. 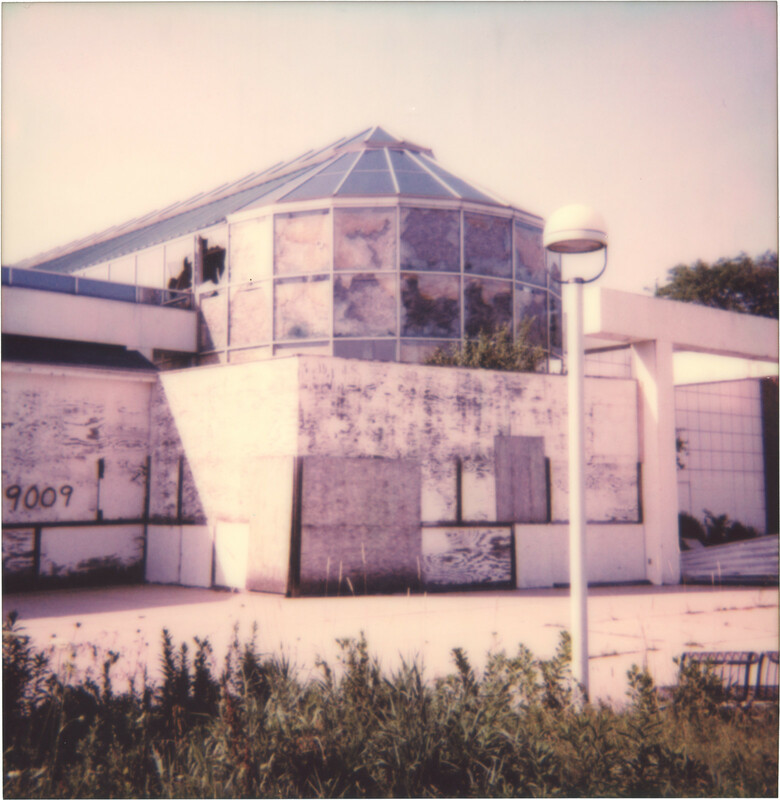 Walking back to the car, we pass the long boarded-up entrance to the mall’s food court, frozen in 1988 even on a 90-degree summer day. 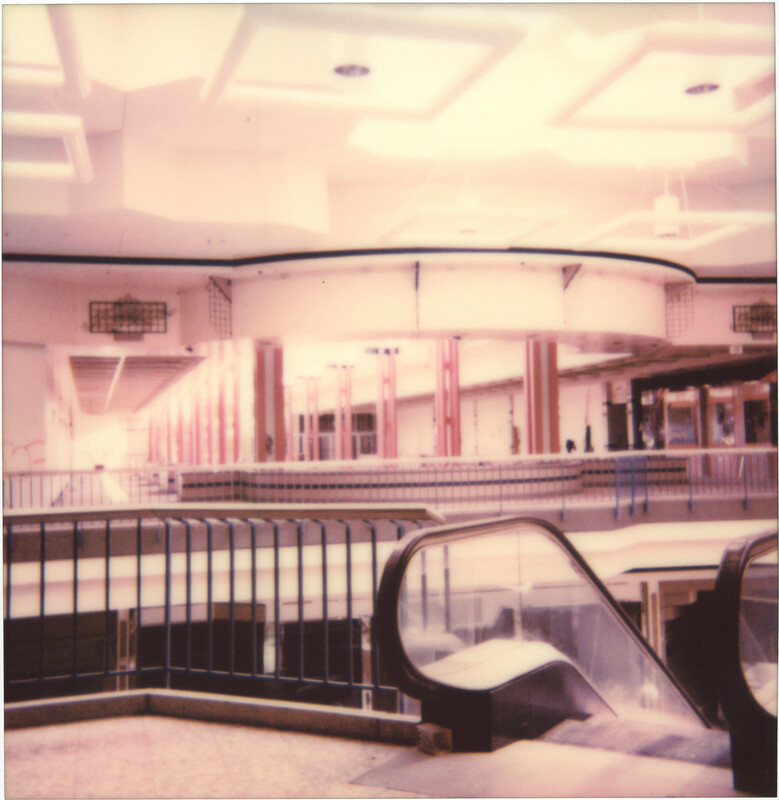 The neon lights of this mall were permanently darkened by plywood walls fifteen years ago, when it finally succumbed to its tanking reputation and the last stores abandoned ship. Until this year, it stood as an eyesore on the outside, but a time capsule of the 20th-century American retail sector, within. Couple of notes… the film I used was off-the-shelf “Polaroid Originals 600 Color” stock. Yes, everything looks pink. No, I don’t like it — the heat got to this film, unfortunately it’s a recurring problem with the film right now. 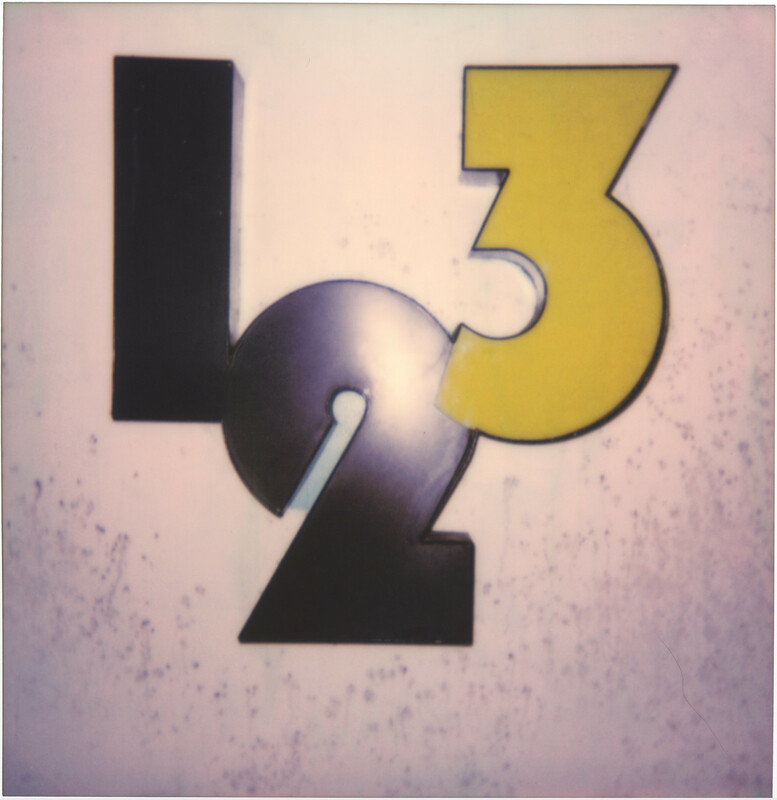 For those also uninitiated: the legacy Polaroid Corporation shut down film production in 2008. Another company purchased the Dutch factory and machinery, and was able to reverse engineer the medium to keep millions of Polaroid cameras like this one from subsequently becoming paperweights. As a result of this: because the new film is simply thicker than before, there are now only eight shots to a pack versus the old ten. I am just loving these Northridge posts! I keep checking back on your page for more pics from the archive 🙂 Sad to hear the vandals are getting at it though. I always kept hope alive that someone would revitalize this mall again one day. I think that’s probably a pretty far fetched dream though. Thanks for sharing! These are great. Though I never visite Northridge, it reminds me of so many of the malls I visited growing up in the ’80s and ’90s. About 20 years ago, I even did a research paper on the history of the shopping mall for my graduate program. 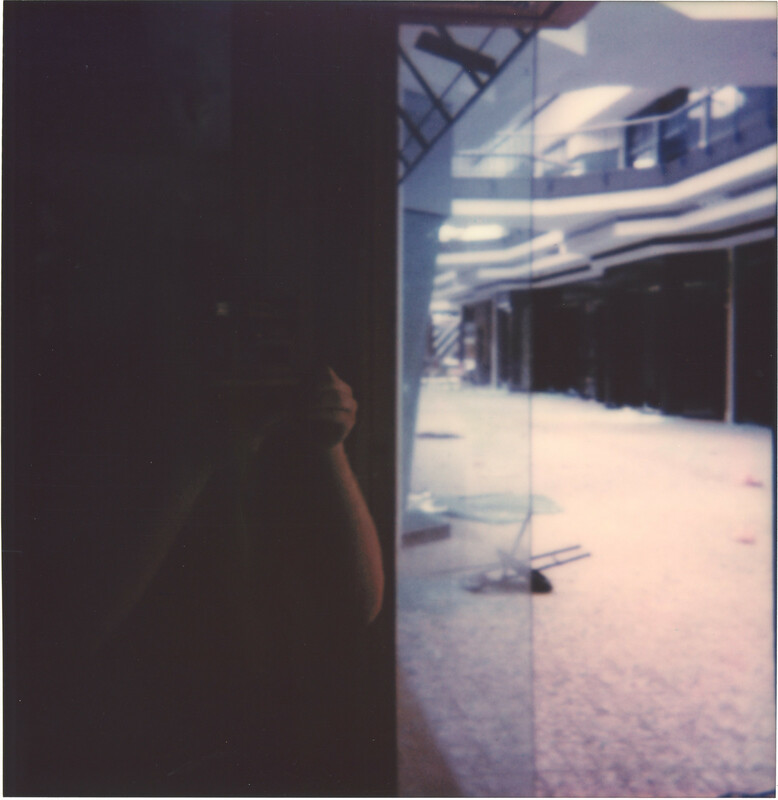 Somewhere, I have a bunch of photos of at least one early Detroit mall that is no more when it was still bustling. Anyway, thanks for sharing these!